It is therefore necessary to ensure that when replacing a later style top cover (with the integrated relief valve) that either the same design of top cover is used or a relief valve is fitted into the system somehow. We’ve already mentioned that the earlier pumps had a relief valve fitted to the pump itself. 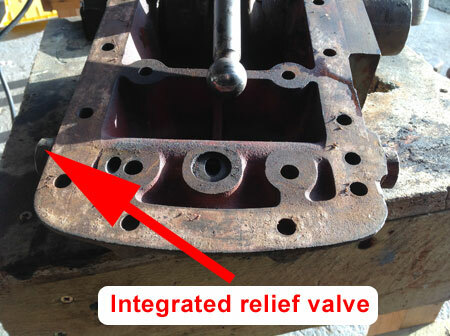 The later pumps had a blanking plate over where the valve was fitted, so it is simply a case of removing the blanking plate and fitting a new relief valve. This is the option that Keith took with his TEF-20 when faced with this situation. This isn’t as neat as the internal valve option, but it would never the less do the job and get your tractor going. An off-the-shelf pressure relief valve could be plumbed into one of the external ports with a return back to the reservoir. Normally returns would be plumbed in below the oil reservoir to prevent foaming, but this shouldn’t be strictly necessary for the odd occasion that a relief valve would operate. Once fitted, start with it slack and then adjust upwards to the specified pressure using a pressure gauge. I purchased a copy of your DVD on TE-20 Hydraulics a couple of months back. It is excellent and I could not have asked for more. My problem is salt water has got in via the PTO and I have had a major refurbishment and cleanup on my hands. All ready to put it back together and have hit a major problem with the top lift cover. The arms are frozen and clearly salt water/emulisified oil has meant a total sieze up. We cannot shift the arms off to get the bushes or spline out. Incidently my TEA is a 1956 serial 517+. It was one of the last 750 ever built. The solution was to purchase a replacement top cover. It arrived last week and sadly is off an earlier model, and the poppet type safety valve is missing. Mine does not fit as its the later ball type per your video. I am tearing my hair out as I cannot locate the correct poppet valve. Seems there is more than one size of earlier editions. My new replacement cover has a much smaller diameter hole. Can I just blank it off and have no valve at all? I only use the Fergie for boat launching so there is no extreme hydraulic pressure being exerted on the unit anyway. If that’s not possible, then can I modify the ball type valve assembly, or the larger diameter poppet valve that I am the proud owner of! Thanks for any assistance. It is clearly too dangerous to have a system without a relief valve in there. One mistake by the operator (or an unsuspecting operator) and you could easily end up looking for another top cover; or worse still, have an accident. If you are unable to source the parts you need then hopefully one of the options highlighted above will work for you.